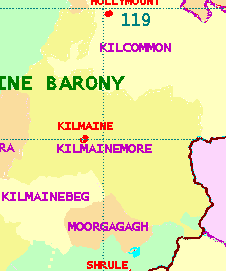 KILMAINMORE, a parish, in the barony of KILMAINE, county of MAYO, and province Of CONNAUGHT, 3 1/2 miles (S. E.) from Ballinrobe, on the road from Galway to Westport ; containing 4176 inhabitants. It comprises 8087 statute acres, principally in pasture, and has excellent sheep pastures at Ellistron. Fine limestone is quarried, and at the eastern extremity there is a considerable quantity of reclaimable bog, but fuel is scarce. Petty sessions are held every Wednesday at the village, which is a constabulary police station, and has a penny post to Hollymount. Fairs are held on July 12th and Oct 28th and are well supplied with cattle and sheep. Ratbgraher, of C. H. Cromie, Esq. It is a vicarage, in the diocese of Tuam, episcopally united to the rectory and vicarage of Moorgaga, and part of the rectory and vicarage of Kilmainbeg, and is in the patronage of the Archbishop, as is also the rectory, which forms the corps of the prebend of Kilmainmore in the cathedral of Tuam, and is held with the vicarial union. The tithes of this parish amount to £399. 18. 101., and of the union, to 4582. 9. 04. There is a glebe-house, with a glebe of eight acres. The church is a plain neat building, to which a tower was added about 20 years since by the Rev. F. Rutledge. In the R.C. divisions the parish is the head of a union or district, which is co-extensive with that of the Established Church: the chapel is a splendid building, lately erected by the Rev. J. Browne, a little to the west of Kilmain, on the road to the village of Neale. The parochial school is aided by annual donations of £5 from the rector and £6 from the curate, who has also given two acres of land, and Mr. Flanagan a house rent-free; a school is partly supported by the parish priest, in which about 160 children are educated, and there are two private schools, in which are about 70 children. In the centre of the village are the ruins of an ancient religious house, with a large burial-ground attached ; and there are ruins of ancient castles at Turin, Ellistron, Ballisnahiney, Cragduff, and Killernan. A spring rising in the village soon disappears and takes a subterraneous course for about a mile; in the winter it forms a turlough. This place gives the title of Baron to Lord Kilmaine.